Golden Jubilee Banquet for the St. Agnes-St. John's Nepomucene Roman Catholic Church parish. Bellevue Stratford Hotel. 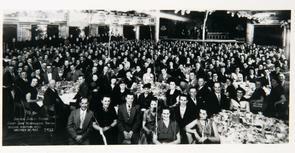 Photo is from November 30, 1932, and given out at Banquet in 1952.